Do you love or hate salmon? I feel like there are not many people who are indifferent. We love salmon, and we usually try to have it about once a week. 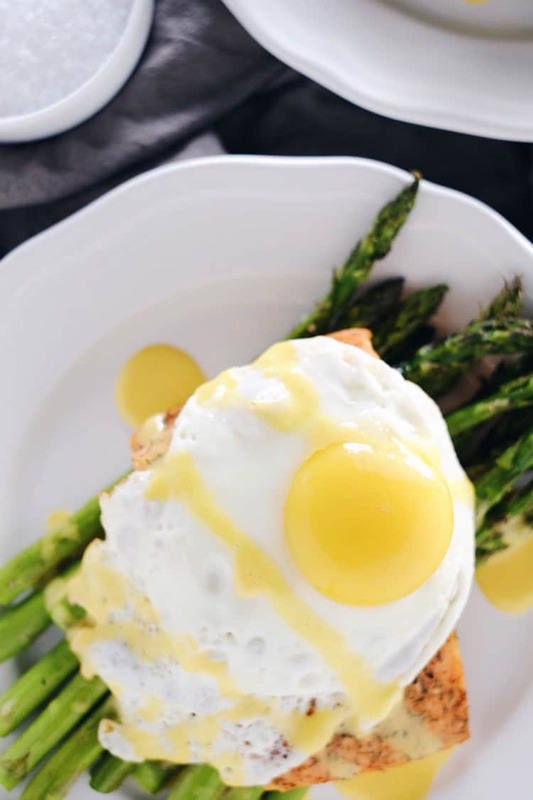 This roasted salmon and asparagus with hollandaise sauce is our latest craze! Ok, let’s just dive right into the best part of this recipe, the hollandaise sauce. Seriously, I think I may have been missing out my entire life. Did I not know it was so delicious or did I just not care? I was never really a fan of hollandaise sauce until Justin whipped up a batch for this salmon recipe. And now, I cannot stop thinking about it. I want a fresh batch with every meal, so I can pour the buttery, creamy, and delicious sauce all over whatever I am eating! Just think of all the yummy things you can do with this sauce! 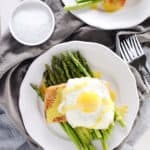 In this dish, the hollandaise sauce is definitely the star, but don’t discount the perfectly cooked salmon and asparagus that retains just a tiny bit of crunch. Then, the egg on top with its gooey yolk center. This recipe makes me want salmon for dinner every night of the week! Every. Single. Night. 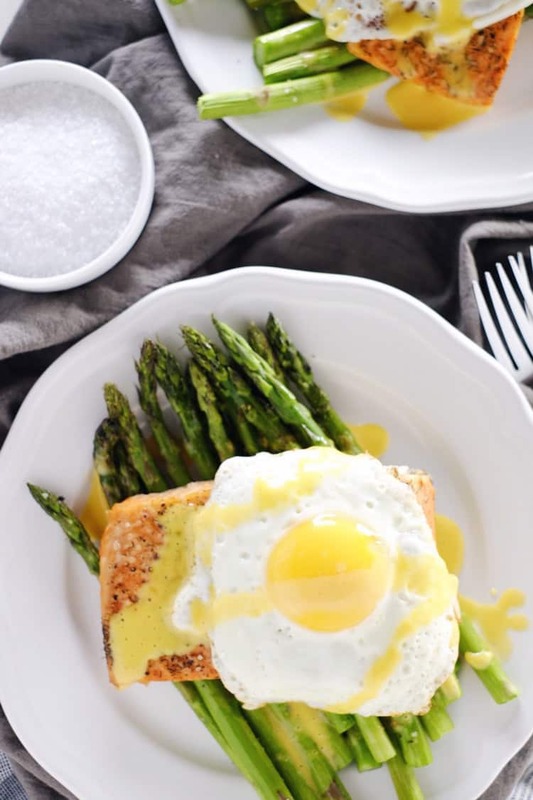 You can enjoy this roasted salmon and asparagus with hollandaise sauce for breakfast, brunch, lunch, and dinner. I think brunch is my favorite. I mean, isn’t brunch everyone’s favorite?! 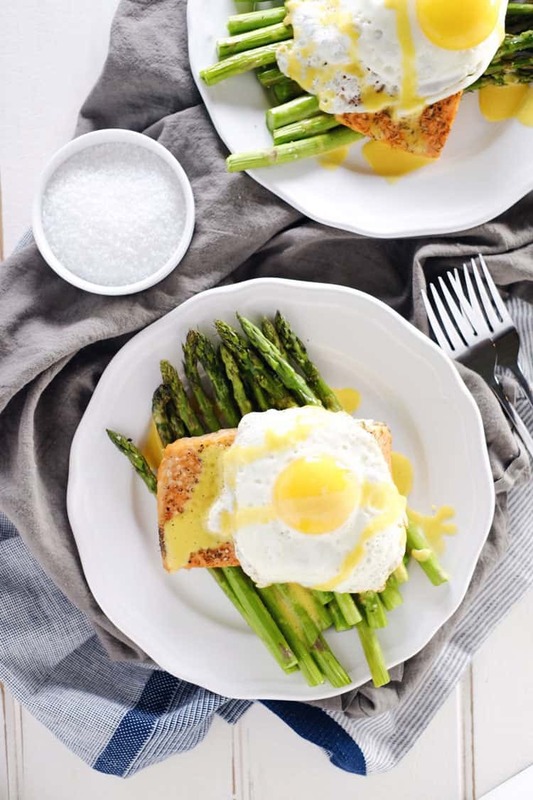 Make this roasted salmon and asparagus with hollandaise sauce, and let us know how it goes by leaving a comment below. Take a photo, and tag us on Instagram @realsimplegood so we can check it out, too! We love salmon and usually try to have it about once a week. This roasted salmon and asparagus with hollandaise sauce is our latest craze and it's Paleo! Note: the hollandaise sauce will make a larger batch than you need, but a smaller batch is only feasible if you have an immersion blender. In a regular blender, you need more liquid. Place the salmon on baking sheet and season with salt, pepper, and dill. Bake for 15-20 minutes depending on the thickness of salmon pieces. While the salmon is cooking, prepare asparagus by cutting off the thick ends (about 1-2 inches). When the salmon has 10 minutes left to cook, take it out of the oven and add in the asparagus to the baking sheet in an even layer. Drizzle asparagus with oil and season with salt and pepper. Return pan to oven to cook for remaining 10 minutes. After adding asparagus to the oven, prepare hollandaise sauce. Whisk together egg yolks, lemon juice, salt, and cayenne until slightly thickened. Place mixture in a blender or food processor. Blend while very slowly drizzling in the melted butter. Taste and add more seasonings if desired. When the salmon and asparagus are finished, cook eggs for topping if you are having eggs. We like fried eggs over easy, but poached would be perfect for this recipe too. Finally, plate your meal. Start with an asparagus base and top with salmon and egg. Drizzle hollandaise sauce over everything and sprinkle with a little dill. Serve and enjoy! Nutrition facts are an estimate provided for those following a Ketogenic or low-carb diet and do not include the optional eggs for this recipe. See our full nutrition information disclosure here. This hollandaise sauce is to live for! I want to put it on everything it’s so delicious! Even my picky eating house guests came back for seconds! Again your recipes have tricked people into thinking I’m a master chef! This was such a rich delicious meal I will definitely be making this anytime I’m cooking to impress!!! Hooray!! We love doing that to our guests, too! 😉 Hehe! Can’t wait to see what you make next!